It’s been years since I tried to do much with my Facebook page besides sharing new art or recent sales. And while that gets some attention, I wouldn’t say the interaction on most posts is massive. That’s what got me searching for art giveaway ideas that were fun and novel. I found a surprising lack of anything other than the typical, get people to comment on a post for a chance to win type. I’ve been there and done that years ago and it didn’t inspire me. I poked around for ideas off and on the past year and nothing struck me as interesting enough to move into action mode. Last week I was searching again for art giveaway ideas and came up with something I thought was fun. Ironically it was from reading about a social media contest that was not for art. I don’t remember the particulars as it was to do with sports and involved a Super bowl giveaway of some sort. And that was when I had my Eureka moment. A contest would be a lot more fun if there was an element of team sports involved. Note – I had this post geographically targeted so you may not be able to see the post if you’re outside of the area targeted – sorry! That appears to be why I could not embed the post here. I didn’t want to encounter issues with expensive shipping. But if you can’t see the post, I can tell you that it had over 200 comments in the end and had been shared, liked,etc. The people who follow my page seemed to really enjoy it as did I! I’ve never been huge on Team sports but in this case, I was happy with either team winning. People who chose the sunrise fishing print were “Team Sunrise” and the people who chose Dublin In The Rain were “Team Dublin.” And that was the way they and I referred to the teams in question. Not only did I enjoy it, I had multiple people who commented on how much fun it was. There was a lot of interaction on this post and I really got to know a lot more about many of the people who follow my work. We exchanged stories as we waited to see who the winner would be on Saturday. I do have one key takeaway from my attempt at finding novel art giveaway ideas. For future social media contests, I would probably choose images that were a little more thematically similar. Two landscapes for example – a clear connection. This time I simply chose two pieces I had shared recently that had received a good deal of feedback. I could be wrong but I think a coherent theme would make the results a little less lopsided. You see Team Dublin was overwhelmingly the winner. Team Sunrise had ardent supporters but not as many. The result was a clear winner early on. That didn’t seem to kill the competition but it’s possible it would have been stronger. And yes, as art giveaway ideas go, this is one I intend to try again. It’s not something I can do weekly but I’ll crunch the numbers and see how often makes sense. At any rate, I’ll definitely try again, it was a fun and it gave me a chance to really communicate with the people who follow my page and enjoy my work. In my original post, I asked them to tell me what they would do with the prize if the won – was it for them or potentially a gift. And on that point, I’m so glad I didn’t use their intended use as any sort of decision-maker. There were many incredibly sweet reasons they wanted their chosen print whether as a gift for someone they loved or to remind them of someone – often someone now absent. One happy but unexpected result from this competition was that when I offered specially priced canvas prints at the end, I had a few people who had not won but took advantage of the offer to get prints now. It’s possible that was pure chance but I can’t help wondering if they were more “invested” in the artwork they had chose as a result? It may be possible that art giveaway ideas like this don’t just generate interaction but have a knock-on effect afterwards. Hope this gives other artists an idea how to handle their social media following and for my own followers who may be reading this, I hope this gives you some insight into the process. And most importantly I hope you know I genuinely did enjoy the whole thing from getting to wait to see who the winner would be, to giving the gift, and, of course, the chance to get to know many of you better! 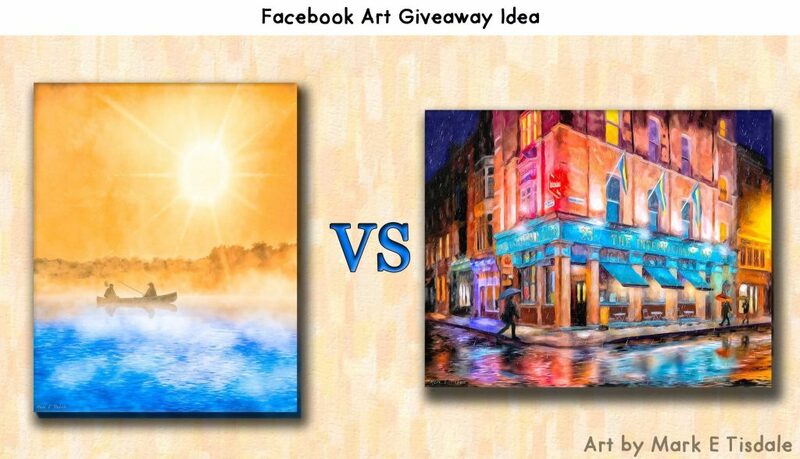 Post Script: I will add when you are developing your own art giveaway ideas, be sure you read the rules for contests and promotions on Facebook or the social media channel of your choice. I believe my promotion complied with the rules but in no way am I promising you that I’m correct. I did boost my post during part of its run so hypothetically my post was reviewed by a human before it was approved but I have no way of knowing it that means it was deemed appropriate or if nothing triggered an actual human review.